How good is our corporate blog? Ranking the most influential corporate blogs. And the winner is…. Facebook ‘Likes’ predict your sexual preferences. 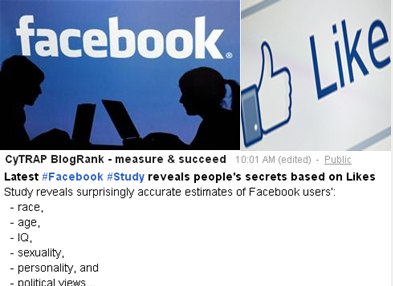 Does Facebook really reveal secrets we have not shared yet? Should I worry that my Facebook ‘Likes’ will trigger an increase in my car insurance premiums? 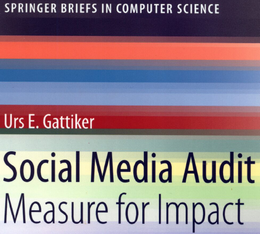 Keywords: privacy, data mining, big data, decision making, discrimination, user rights, social media use. Since their beginnings, social networks have offered opportunities for insight into users’ behaviors and personal preferences. Now a study reveals that the things we choose to ‘like’ may reveal secrets about ourselves we may not have shared. This may include our sexuality, political leanings and even intelligence (click image to view more information and download research paper). This research suggests that we must reflect on how much of ourselves we can safely reveal online. By the way, sign up for our blog – it is FREE! Get the next blog post first. Correlation is a statistical term that addresses whether two variables move together. So, if I like a lot of beer brands on Facebook, does this correlate positively with how much beer I consume? Is the relationship such that the the more beer brands I like, the more beer I consume? Or could the correlation be negative? This would mean the more beer brands I ‘Like’ on Facebook, the less beer I drink each week or month. Of course addressing this issue gets increasingly difficult the more variables are involved. We often try to control for a variable, by essentially eliminating its influence. Accordingly, how much your ‘Likes’ of several beer brands correlates with beer consumption may be better explained if we control for some effects. An example would be how many hours we spend doing physical exercise each week. It seems obvious that people who do a lot of exercise generally drink less than others. In fact, we may find that while younger women love beer commercials (i.e. especially those featuring great looking guys), those that exercise more than two hours each week rarely enjoy beer. 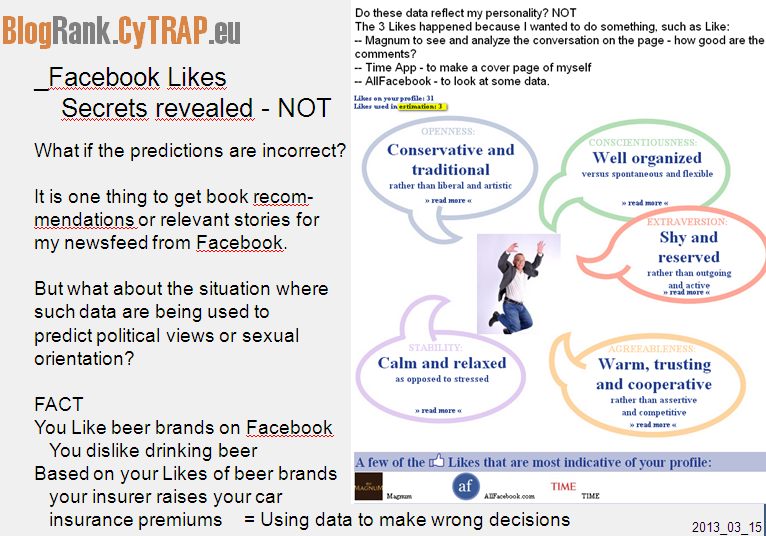 Clearly, just looking at ‘Likes’ may result in researchers making wrongful inferences about a person’s preferences and lifestyle (see my profile below – is this the ‘true’ me?). The study [Kosinskia, Michael, Stillwell, David, and Graepelb, Thore. (March 2013). Private traits and attributes are predictable from digital records of human behavior. PNAS – Proceedings of the National Academy of Sciences of the United States of America] nicely illustrates the need to seriously rethink how much data we are voluntarily sharing online. 1. Like curly fries? You’re clever? NOT: Great to know for the 60 percent of cases where researchers were able to predict IQ based on a test of Facebook ‘Likes’, but what about the 40 percent whose ‘Likes’ predicted that somebody was gay when the person was not? 2. The way I use Facebook, LinkedIn or Twitter is not necessarily the person I am: For instance, I Liked Time magazine’s Facebook page to gain access to an application, that allowed me to generate a Time cover page with my image on it. Thus, data generated (see my image above) by my liking of this page (and also All Facebook and Magnum Ice Cream) would suggest that I am a serious and shy person. But as anyone who knows me personally will tell you, it is misleading. Forget using ‘Likes’ in the job recruitment process. 3. Why Red Bull, Heineken and Ferrari might leave Facebook: This is a very important study, because it shows that Liking your page could reveal personal secrets your fans do not want to share (e.g., you like Red Bull? – you take too many risks = time to cancel your life insurance). What if someone went on tv to announce that those that Like the Ferrari Facebook page have a lower IQ, or those Heineken fans are real lushes? A public relations nightmare waiting to happen for these firms. Get more ComMetrics content on Google, Myspace, KPI, ROI and rankings (just click the URL to get some very interesting results). Facebook launched its like button in 2009, and the small thumbs-up symbol has since become ubiquitous on the social network and common across the rest of the Web, too. Facebook announced in 2012 that about 2.7 billion new likes pour out onto the Internet every day – ‘Likes’ endorse everything from pop stars to soda pop and luxury watches. Source: Facebook Likes: Is this job applicant a drug addict? 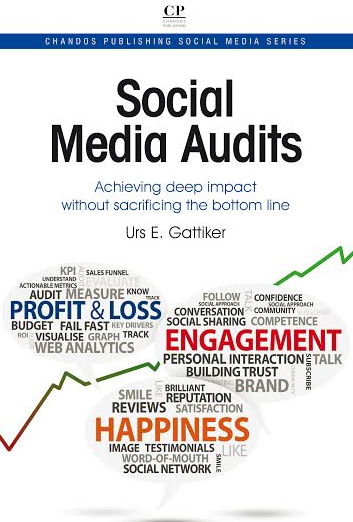 Are you worried about what others could infer from your ‘Likes’? Leave a comment below. Previous post: The new Myspace: Too little innovation, too late? Next post: Email is dead; long live email!